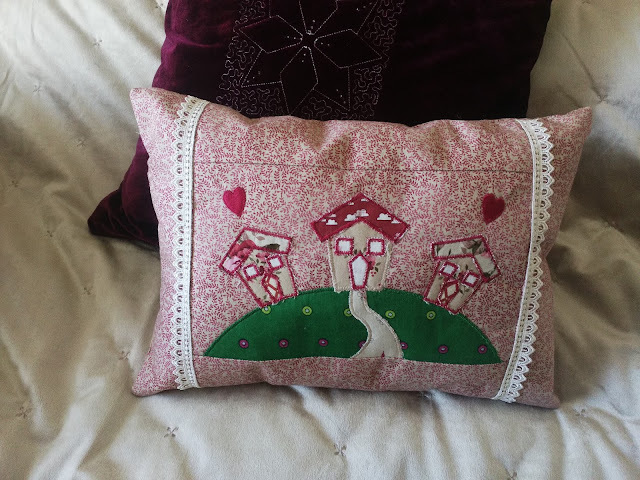 You are invited to an event with Sweet Pea Embroidery from Australia who are visiting Jaycotts and a very limited number of other places in the UK. This is a unique event so make a date in your diary and come along to the Chester showroom and meet Alison, Annette and the team from Sweet Pea. You will also meet Melanie who is the Regional Manager and Product Specialist for Brother Sewing Machines. Alex and the team from Jaycotts will be there and of course myself. Sweet Pea Embroidery specialises in "in the Hoop" embroidery and examples of just some of the designs you can make are shown on this post. What is " in the hoop" embroidery? 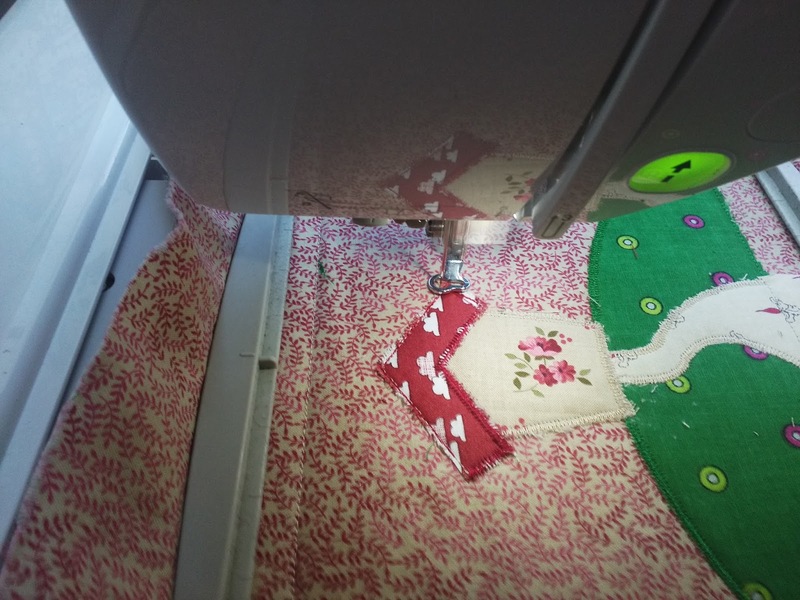 Well, usually embroidery is done on a finished article or a part made blouse front for example, but with this method you are making an actual piece of work which is fully or partially completed in the embroidery hoop. The designs are perfect for people who want to expand upon the normal activities done on an embroidery machine. You need to see it to believe it! It is incredible to imagine that all of these designs were made on an ordinary domestic embroidery machine, even this soft toy. Sweet Pea go to endless trouble to produce thoroughly detailed instructions so you can follow each step closely with words and photographs. There are panels which can be used as table runners or wall hangings, quilts, table mats and coasters. Bunting, bibs, hats - the list goes on! And do look at this, what child of any age would not be delighted with it? One point which I found interesting is that Sweet Pea allow you to sell your finished designs, something which a lot of companies forbid. Don't forget to sign up for their mailing list too. 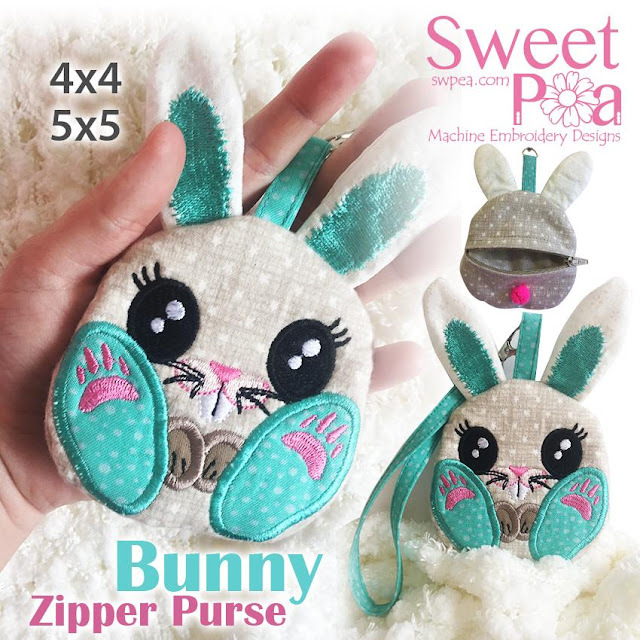 This bunny purse is so cute don't you think? One thing I find amazing - and you won't believe this - but the zip is inserted in the hoop by the embroidery machine! There are a few free designs to try on their website and Facebook sites so there is no need to purchase a design initially. 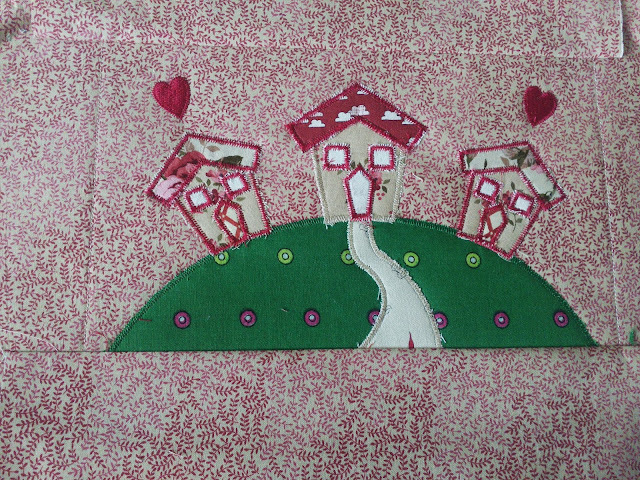 Be warned though, Sweet Pea designs are very addictive as I am finding out! I have of course tried a couple of designs myself. This is a pillow. I used a good quality craft cotton, wadding and a stabiliser. It is vitally important that you take care to hoop your fabrics tightly because the fabric needs to stay taught in the loop. If you don't then there will be a lot of wrinkles around the embroidered areas. The instructions tell you step by step how to prepare your fabrics. The first thing which happens is that the embroidery machine sews around the outside of the design to hold all the layers together. 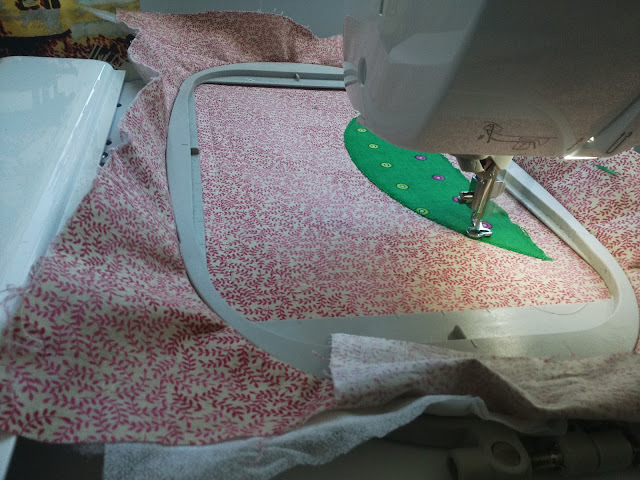 Then the outline of the hill is sewn and you then need to take the hoop out of the machine and place the fabric for the hill over the outline, put it back , stitch it in place and then trim the fabric before satin stitching the applique in place. Each piece is added in the same way. It is a little bit fiddly but the results are really worth it. It is not difficult and once you get used to working differently you will work through the designs quickly. It is so pleasurable you won't want to leave your craft room! This is my finished design. I was amazed to find that the embroidery machine sews the side panels on too, still in the hoop! Once the design was finished all I needed to do was to add some lace trim and sew the backing on with my regular sewing machine.It was simple enough to then stuff it and slipstitch the opening closed. And this is my finished pillow. I have some more designs to work, and I'll let you know how they progress. 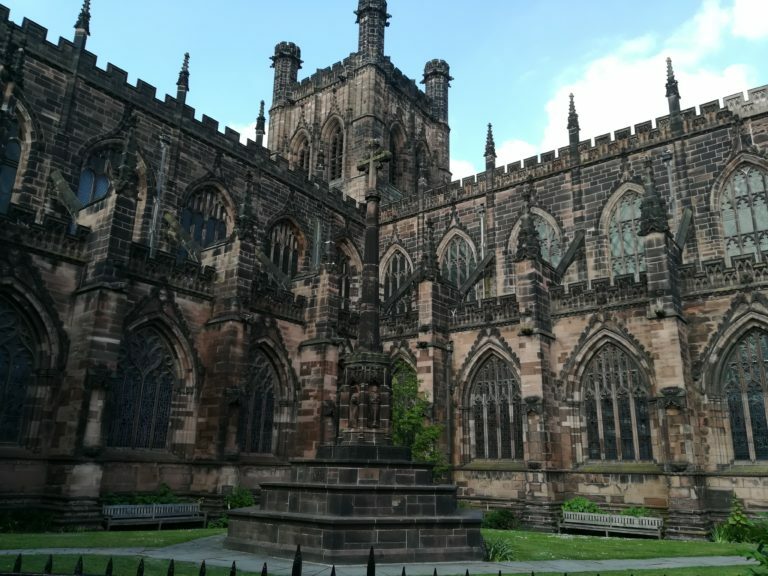 If you have never visited Chester before you are in for a treat, so why not turn your visit to this event into a short break? The Chester lifestyle website gives lots of information on things to do and see, places to eat and stay and where to shop. 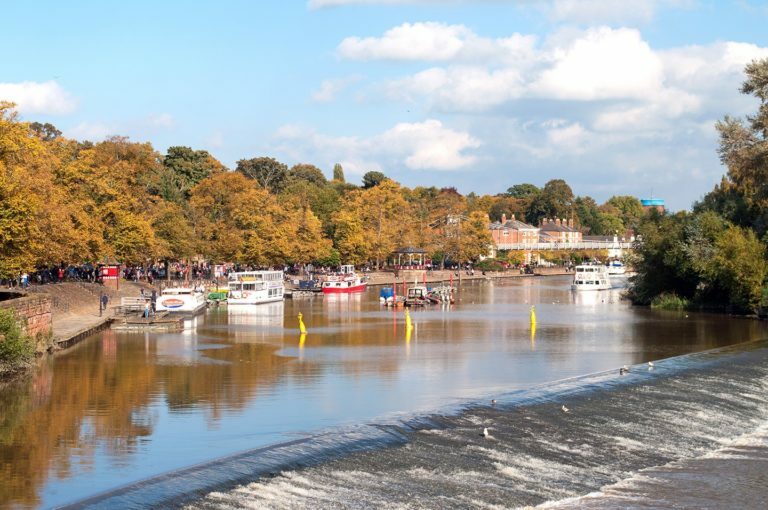 It is a very pretty city and you will find that it caters for everybody from history lovers to boating enthusiasts. Chester Lifestyle has some Hotel Ideas and will be pleased to tell you more about Chester if you contact them - details are on the website. Jaycotts are proud to stock an extensive range of Brother Sewing Machines and accessories. Senior staff are always on hand to talk you through the various machines and let you try them out. Take a look at the range of Brother Sewing machines on Jaycotts web site and make a note of what type of machine would suit your needs best. This is a great opportunity not only to say hello to the famous Sweet Pea ladies but to take advantage of the expertise of Melanie from Brother and the wonderful Jaycotts family. So, I hope that you will save the date in your diary and come along. I'm willing to answer your sewing questions too. So don't miss out! The contact details for Jaycotts are above, but there is an online contact form on Jaycotts web site where you can also register for the newsletter and be the first to hear about special offers, events and new products. I look forward to meeting you on Thursday April 12th at Jaycotts.